Stream audio from any Bluetooth device to your room's dedicated speakers by installing the IST Bluetooth Volume Control with Amplifier. This elegant volume control wires into your speakers (in-wall or bookshelf) and pairs with any Bluetooth smartphone, tablet, or other device, providing a simple solution to adding Bluetooth audio to a single room. Easily amplify your smartphone's apps like Pandora, Spotify, Youtube, Netflix and more. Want to listen to a traditional analog CD player or other non-Bluetooth device? The volume control also provides a 3.5mm jack for direct connection. And finally, the unit serves as a traditional in-wall volume control, allowing you to adjust the volume with a turn of the knob. Available Colors: White, Almond and Ivory interchangeable faceplates included for both units. The IST Bluetooth Volume Control with Amplifier consists of two components, 1) the main Bluetooth-enabled volume control unit with a built-in class D amplifier and 2) a 24VDC output unit with a 3.5mm audio jack. Installed next to the main unit, the output unit delivers analog audio to the volume control/amplifier for amplification, as shown in the diagram below. The built-in amplifier allows amplification of your streaming/connected audio without requiring connection to a larger audio system — the volume control does all the work! 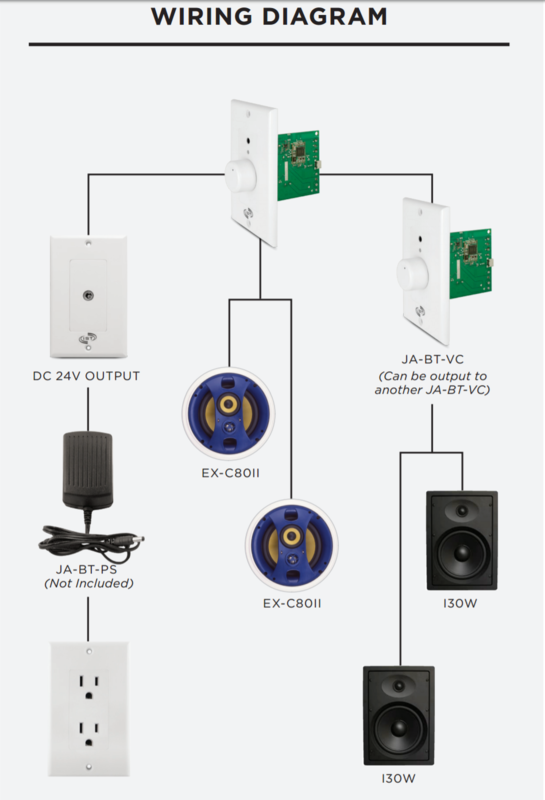 The volume control/amplifier unit is designed to easily replace a traditional volume control. It installs into a standard electrical box and can use existing 16 gauge speaker wire. The output unit mounts nearby and wires into the main unit. Both receive power from a 24VDC power supply (not included). *Must use additional power supply (24V-5A). The volume control unit's Bluetooth technology is Bluetooth version 4.1. Bluetooth wireless range is over 30 feet without obstacles. An LED on the volume control indicates On/Off and Pairing status. Music play (speed) can be synchronized with your movie when you play the movie with your smartphone. Android users also have the option to customize the unit's Bluetooth name. NOTE: Speakers and power supply not included. Approved AC-DC power cord with 24V 3A minimum for rated power output needed. Power Supply Recommendation: 110~240V AC input, 24V DC output, 3A, UL approved, DC female standard Î¦2.1mm.